Are Interfaith Dialogues Being Exploited to Promote Islamist Bigotry in the West? 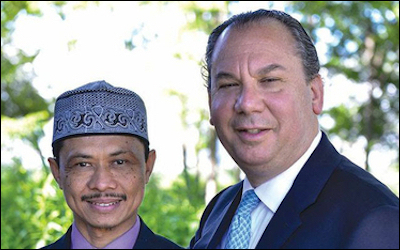 Shamsi Ali (left) and his interfaith partner, Rabbi Marc Schneier. Interfaith dialogue seems like such a noble cause. In this age of religious-inspired terror, what could be better than bringing preachers of different faiths together in search of a common good? However, it seems that interfaith dialogue is increasingly being exploited by extremists, who have learned to praise other faiths in public, but curse them behind closed doors. Take Shamsi Ali. He is an imam from Indonesia who currently leads the Jamaica Muslim Center – one of New York's largest Muslim community centers. He spends many of his evenings taking part in prominent interfaith events. On May 6, for instance, Ali spoke at a screening of a film about the world's different faiths, described an "intimate documentary ... full of profound wisdom, love and respect." The event organisers assumed Ali would be the perfect commentator, describing him a "religious scholar and interfaith bridge builder in New York and beyond." Ali would have been a familiar face to many in the audience. For years, he has been building his interfaith credentials, speaking at hundreds of events. Just a week before the film screening, Ali spoke on a panel at a Catholic community center alongside Christian and Jewish leaders to commemorate the life and work of Pope John Paul II, and to share "stories of their Interfaith journey." Ali's interfaith fame goes beyond weekly speaking events in New York City. In 2013, the BBC published a lengthy profile of Ali, which reported that he had been forced out of his former mosque because of his "friendship with the Jews." On the face of it, Ali is a perfect subscriber to the interfaith ideal. But what does Ali preach when he's not delivering homilies about his "journey"? A closer look at his social media posts, all written in Indonesian, reveals a rather different set of views. "Since 1947," Ali writes, "the Zionist Jews has been subjugating Palestine and Al-Aqsa Mosque." Elsewhere, he adds: "Protecting the Jewish state is not the West's real interest; to the contrary, the West aims to cover up as well as strengthen its influences in the region. Of course, the only goal is maintaining the interests of world capitalism, particularly in regards to the discovery of oil fields in the Gulf States region." In one particular angry sermon, Ali declares: "Jews are working to destroy Islam and the Ummah [the worldwide Muslim community]." Of course, opposition to the Jews means support for Islamist groups dedicated to their eradication. Ali expresses "respect for the fighting spirit of Hamas." Not all of his venom is reserved for Jews and Israelis. Ali describes homosexuality as "an unbearable epidemic," and laments the West's acceptance of homosexuality, claiming that Muslims who oppose it are "considered to be against human rights and freedom as well." The exploitation of interfaith dialogue by Islamists is not a new story. But it is one that religious leaders from all faiths continue to ignore. The most dangerous consequence of allowing extremist imams to monopolize interfaith activities is that their participation often means the exclusion of moderate Muslim groups. Partly, this is because "interfaithing" with Islamists serves to legitimise them and their groups as representative voices of Western Islam, despite their lack of mandate from ordinary Muslims. But even worse, there have been occasions in which moderate minority Muslim groups have been excluded from interfaith activities for fear of upsetting existing Islamist partners. In 2011, for example, the British government discussed with the Inter Faith Network, a taxpayer-funded interfaith umbrella organisation, an upcoming interfaith dialogue event with members of the Ahmadiyya community, a persecuted sect of Islam – and which is despised by Islamists. One high-ranking civil servant wrote: "Has consideration been given to how this will affect the participation of mainstream Muslims?" The "mainstream Muslims" in the Inter Faith Network (IFN) to which the government referred were not mainstream at all, and were in fact led by the then-board member of the IFN, Manazir Ahsan, a prominent Islamist activist. Back in 1989, Ahsan coordinated the riots against Salman Rushdie and backed the Iranian regime's fatwa for the author's murder. Today, Ahsan serves as chairman of the Islamic Foundation, a Taliban-linked publisher of radical Islamist tracts in the UK. In May 2013, Bangladeshi, Muslim, Hindu and Buddhist activists wrote to the British Jewish leadership, expressing concerns over Jewish interfaith work with British leaders of Jamaat-e-Islami, a violent South Asian Islamist movement. The activists noted that one of the Jewish community's interfaith partners, Chowdhury Mueen Uddin, was part of "the Al-Badr Islamist death squads in the genocide of some 3 million civilians during the 1971 Bangladesh War of Independence." Not long after their letter was published, Mueen-Uddin was convicted of those crimes by a UN-backed war crimes tribunal. But the activists' letter received no reply. Whether in Britain or America, Islamists are often to be found engaging in interfaith dialogue not to find "wisdom, love and respect" with other faiths but to cement their claim to represent ordinary Muslims, and to distract from their history of extremism and hate. Shamsi Ali is one of those Islamists, and too many community leaders have turned a blind eye.